In breaststroke 101, we covered the movement of the legs, a sweeping motion that propels the body. In this second part, we’ll look at arm action in breaststroke. To recap on the last lesson, the movement of the legs and arms in alternation allows smooth streamline which is essential to breaststroke- and any other style. To be able to move on to practicing hand movement, you have to be able to kick without support and stand after several kicks. All through, the hands are supported, either on the walls, rungs or on a kick-board. In this lesson, the hands release their support and the swimmer is ready to use their arms, first alone, then in coordination with the feet. The breaststroke arm movement consists of the glide/resting position, followed in progression by an out-sweep, catch, in-sweep and recovery. In this phase, the body is horizontal, lying on the water with the arms stretched out, close together and the palms facing down. The legs are extended and pressed close together, with the toes stretched and pointing back. This is the streamline position. Palms of the hand are turned outwards and arms moved to the side pushing out water until they are outside shoulder length. Arms are straightened, while elbows remain close to the surface, forming a Y shape, while the legs remain together and pointed. Orientation of arms changes and forearms plus the palms face backwards, ready for the propulsive phase. The outstretched palms facing down are pulled back and down, while elbows remain close to the surface, offering propulsion until they are at 900 with the rest of the trunk. Palms are brought together at the center of the mass for the in sweep, meeting below your chest. Elbows are closer to the ribcage as they are in the natural standing position. 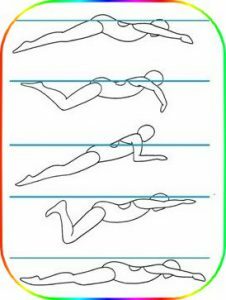 In this phase, the hands regain their position by stretching forward to the streamline position, recovering either on or under the water surface. 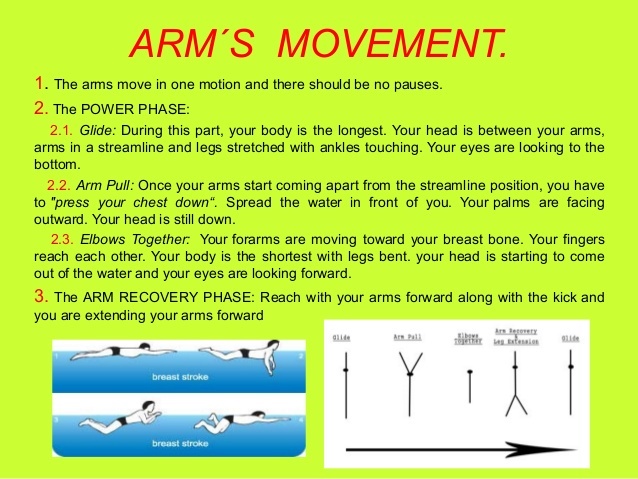 It is often common for swimmers to put more effort in the arm movement, hoping to gain more strength from the arms. However, the breaststroke kicks are the source of the most propulsive force and should be used to provide the greatest momentum. In conclusion, the arm pull should not be too wide as to imbalance the body, but should be within the shoulder length to allow quick recovery. Quick recovery guarantees a faster and more efficient swim. In shallow water, try moving the arms through the stages while standing bent at the waist so that the upper trunk is in water. The swimmer should ensure that they can feel the propulsion and water movement caused as they practice the steps. This animated video by BBC may offer more info.